7 Kids and Us: Legacy Premium Food Storage- Are You Prepared? Legacy Premium has a wide variety of freeze dried foods to help you prepare in an emergency. Living in a state where we have hurricanes, I know for my family, just to be safe, we have several freeze dried meals packed away in a safe, along with a supply of medicines and water. The kits start at around $30 and go up from there depending on what you are looking for. The kits include way more than just food too, they also come with things like can openers, rope and knives, if you opt for one of the deluxe kits. At Legacy Premium, they have one goal in mind: Helping you prepare your family for emergencies by providing the best prices for freeze dried food storage anywhere on the web. 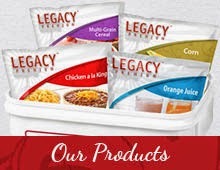 We proudly offers Legacy Premium, the wise food storage choice, because of it’s lower cost per day, greater freeze dried meals variety, gourmet tastes, and incredible value. Find out where you can purchase a kit here.